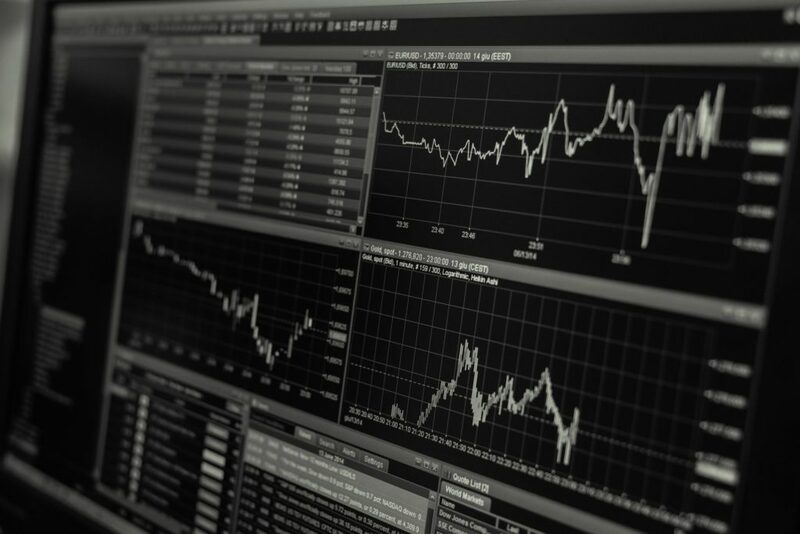 The Dow Jones Industrial Average is headed for its first negative week of 2019, and there are a few key reasons the stock market's recent rally has slowed. The Dow and S&P 500 indexes each climbed over 7 percent in the past six weeks, but the rally in U.S. stocks has paused. 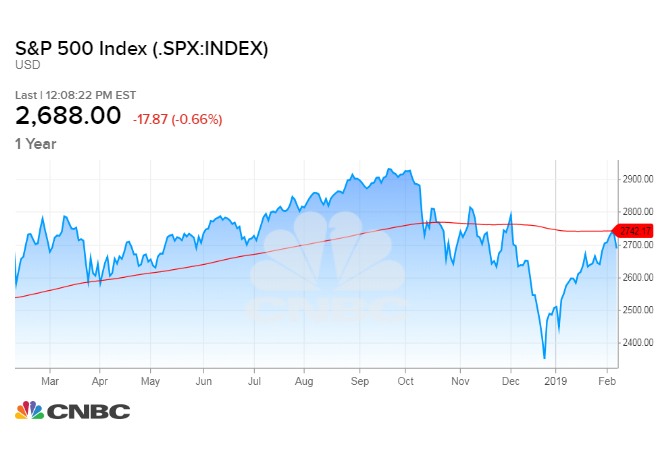 After many stocks rallied during the best quarterly earnings season in nine years, investors began looking at the current quarter and the year ahead — and the 2019 outlook is not great. 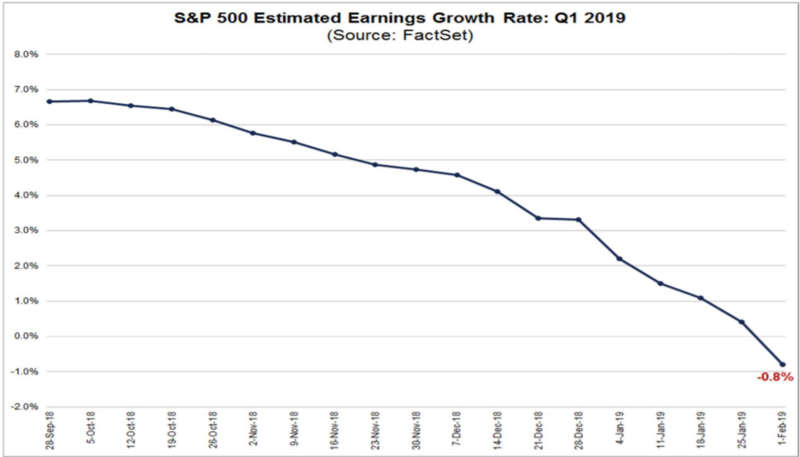 Wall Street analysts are slashing earnings expectations for the first quarter of 2019 so sharply that the overall estimate of profit growth for the period just turned negative. Earnings are now expected to fall on average by 0.8 percent, according to FactSet. That's quite a reversal from September, when analysts expected profits to jump nearly 7 percent. Blame poor company outlooks accompanying the strong fourth-quarter numbers. The slide in expectations matches the view of Morgan Stanley chief equity strategist Mike Wilson, who has been warning of an earnings recession. 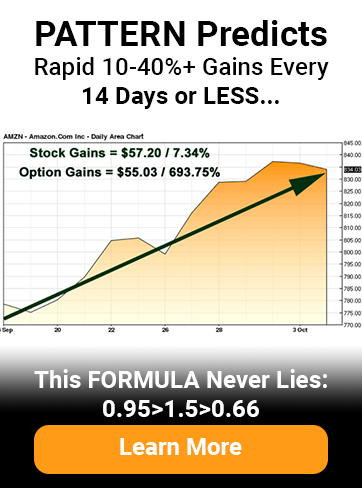 "Earnings are deteriorating even faster than we expected," Wilson said in a note on Monday. "The earnings revision breadth over the past month has been even more negative than we expected leading us to think [the] earnings recession trough in the U.S. could be later than 1Q and deeper." Compounding the year's weak profit expectations has been muddying trade negotiations between the U.S. and China. A critical meeting between President Donald Trump and Chinese President Xi Jinping will not take place before the March trade war ceasefire deadline expires, traders learned on Thursday. Additionally, The Wall Street Journal reported that neither the U.S. nor China has even drafted an accord regarding either country's demands. If a deal is not struck by March 1 then U.S. tariffs on Chinese goods will increase. "We've got a pretty sizable distance to go" in the trade negotiations, White House economic advisor Larry Kudlow said on Thursday. On the technical analysis side of things, the S&P 500 has faced resistance as it approached its 200-day moving average of 2,742 points. That's a key level watched by stock traders, as until October the 200-day moving average had supported the bull market rally of the previous three years. The recent rally saw the S&P 500 climb all the way to the 200-day moving average before it backed off again. I hope you found this article helpful and informative.